Note that I have red wine, rosé champagne AND a vodka soda. This wedding season I've partnered with WeddingWire to share my #HowWeWed moment, a campaign celebrating unique and personalized wedding elements (because ICYMI: I'm officially a married woman). One of the most important things for our wedding was that it was us. Cheesy, I know, of course you're wedding it going to reflect who you are. But we both made a big effort to make sure every detail really reflected who we are as individuals and as a couple. As you know, I was incredibly adamant that our wedding's venue speak for itself. Besides the flowers (uhm HELLO THEY WERE PERFECT) I didn't want a ton of color. Neutrals, neutrals, NEUTRALS. And Maxim was 100% on board. The maid of honor and flower girl work a dark grey to match the boys, and Maxi wore a tan linen suit to complement my white dress. WeddingWire asked me to share my FAVORITE "How We Wed" moment, and honestly, though, I couldn't think of one thing that stuck out. "Can the entire wedding be my moment," I kept asking. But here's one thing that I really loved: The cake. I had scoured Pinterest, and chat rooms, and galleries of real weddings to try and decide what kind of cake we should do. I read every advice article I could find. Did we want one BIG cake to stand alone? Did we want a cupcake tower? Did we want cake toppers of us? I even took a cake style quiz. Ultimately, it was important that, like other parts of the wedding, that the foliage and venue speak for itself and that the cake not be too over the top. So we went with a simple three-tier cake covered in white frosting and decorated in fresh flowers to match my bouquet. Our topper was a wooden, cursive piece from Etsy. And, because we were in Key West, we thought it was only right to also have key lime pie tarts. For the ceremony, we wrote our own vows, had open seating and had a special intro for my Latina side. Our minister said a welcome in Spanish (which we all loved). SIDE NOTE: Our minister? He's a friend from California who was ordained online just for our wedding. He and Maxim worked together on product design and I love him and his wife dearly. The two of them are truly one-of-a-kind special people who go the extra mile for everyone. The first time we went to visit them in California, his wife predicted that we'd get married. As you know, we also wrote our own vows, and they MATCHED — we didn't even read each other's before. We had a steel drum player for the ceremony, but our recessional was done by our DJ: The chorus of Everlasting Love. For the cocktail hour, we offered the typical drinks but our food was 100% vegan and easy to eat. We wanted our guests to be able to mingle and chat and enjoy something delicious without it feeling forced vegan. We offered guacamole boats, mini summer rolls and sweet potato pancakes. For the reception, we continued the neutrals with pops of color theme. Our dinner was vegan except for the main courses (we had a fish and chicken option). And for champagne, we opted for rosé instead of regular champagne. Instead of a guest book, we had Jenga (amazing idea, Mom!) and wedding mad libs, which were SO much fun to read. Once it came to dance, we put out giant baskets of flip-flops for everyone. Oh, and Maxim's dad? He built a CUSTOM sign for us featuring all of the locations our guests traveled from using recovered wood found along the Keys! Now your turn to share! Are you a newly wed couple? You can enter to win a $1,000 cash prize from @WeddingWire and a gallery wall from @framebridge. Share your unique wedding moment on Instagram or here. Be entered to win a $1,000 cash prize and a gallery wall! psst: need more ideas? Check out all of the amazing content from WeddingWire editors, trendsetter and REAL brides. 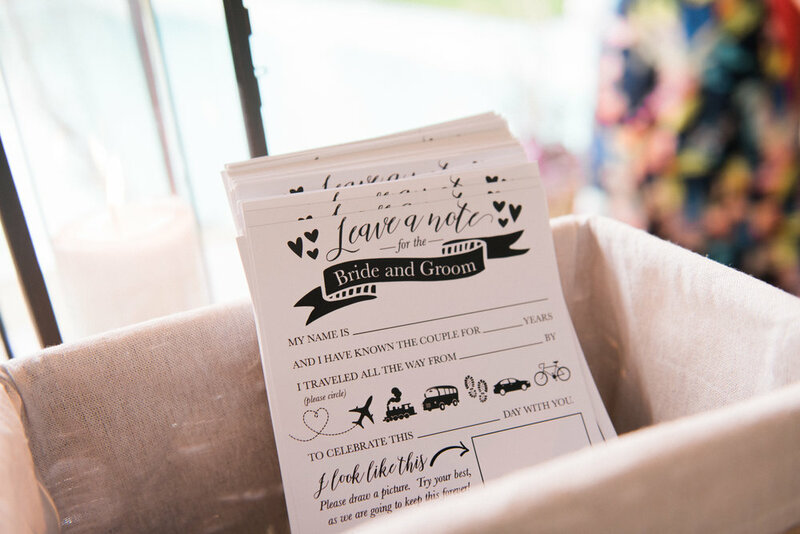 Thank you WeddingWire for sponsoring this post! 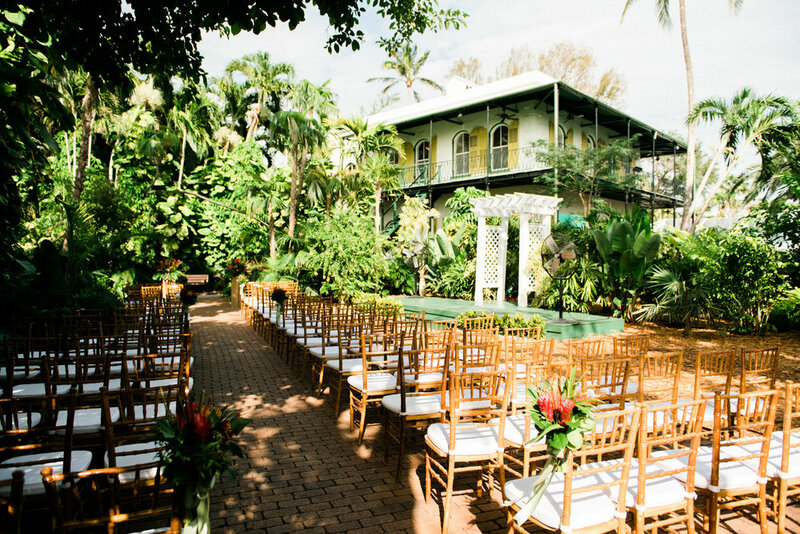 Maxim Wheatley and Phoebe McPherson married at the Ernest Hemingway House in Key West on May 20, 2018. Here’s the first part of everything that went into making the day perfect. We're getting married. In Key West. So we're teaching you how to plan your own destination wedding.